Italy, 2001, 85 minutes, Colour. Lorenza Indovina, Claudio Santamaria, Rolando Ravel. 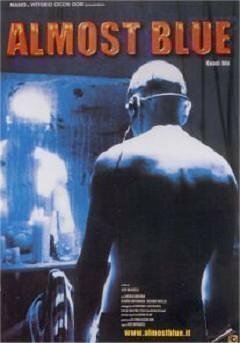 Almost Blue is the first feature film from a young video and rock music film-maker. It is very much a swirling, fast-paced and edited police thriller. It also shows the influence of such slasher films as those by director Dario Argento. The film is set in Bologna where there are a number of atrocious murders of students. There is some connection with the Internet and the chat room conversations between victims and killer. The police eventually understand who the killer is, but need someone to be a decoy for him. A blind genius at the computer, Simon, helps the police inspector (who is looked down on by her colleagues) and ultimately the killer is trapped. It is all fast-paced, sometimes a bit difficult to follow with all the action and swirl. 1. Popular Italian thriller? Police investigation? Serial killer case? 2. The Bologna settings, the city, the streets, car chases? Interiors, police stations, homes? The special effects for the brutal murders? The importance of the musical score and the rock video background of the director? 3. The title and its reference to the voice of the killer - identified by Simon with various colours? 4. The range of murders, the victims, the motivations? The information about the killer? His getting closer, threatening victims, Simon's mother, Simon himself? The final capture of the villain? 5. The portrait of the police, the macho attitudes? The two investigators coming with their theories about patterns of serial killers? The authorities giving them the green light? Grazia and her status, the men criticising her? Her efficiency? The contacts, meeting Simon, her mistakenly setting him up? 6. Grazia in herself, her fascination with Simon, their affair, her not being ready then for the confrontation with the killer, his attack? The sketch of the other police? 7. Simon, at home, blind, his relationship with his mother? The information to the police? The relationship with Grazia and his dependence on her? The confrontation with the killer? 8. The popularity of this kind of combination of police thriller with serial killer slasher movies?